The RGA3 is a robust fall arrest block, and the "big brother" of the RGA2. With its longer working length and heavier construction, the RGA3 has been used successfully by the offshore industry for years. The carrying handle of the RGA 3 is part of the cast alloy housing and can be connected to the anchorage point using soft slings or a karabiner. 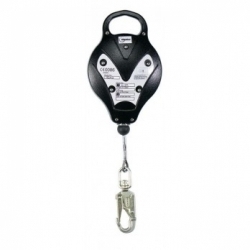 The RGA3 is suitable for use in most industries to provide protection in work areas with overhead anchorage points. The RGA3 has a working length of 15 metres.